DBD Log Homes is a family owned and operated business dedicated to constructing the finest quality handcrafted log homes. We have 30 years of log home building experience. At DBD Log Homes we strive to provide the best possible service and product for our clients, and we know that you will be more than impressed with the end result. Our location in 100 Mile House, British Columbia, Canada allows us access to a secure supply of logs that are of the topmost quality for log home building purposes. 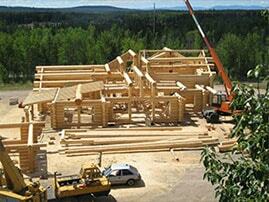 At DBD Log Homes we are proud to employ some of the best log home builders in the business. We would like to acknowledge their contribution and express our appreciation for their hard work and dedication to producing quality log homes. please do not hesitate to contact us at (250) 395-3774 for more information.